Clearly the most popular, and arguably the best, stovetop popcorn popper is the 30-year-old Whirley Pop . This popcorn popper is sold by Wabash Valley Farms. This is actually a real farm that was purchased in 1958 in Indiana. In 1980 they patented the design of the Whirley Pop and the family business changed from farming to selling Whirley Pops. They have sold more than 3 million Whirley Pops since that time. 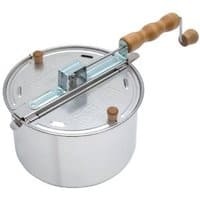 The Whirley Pop stovetop popcorn popper has an aluminum pot and a lid with two doors, steam vents and a crank apparatus. 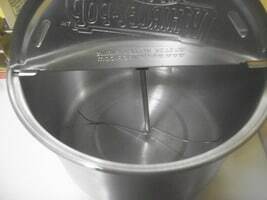 The crank causes the stirring rod (see photo below) at the bottom of the pot to rotate moving the kernels and distributing them and the oil evenly. This action decreases the number of unpopped kernels known as "old maids". It also keeps the popped flakes from sticking to the bottom of the pan and burning. When making popcorn the instructions recommend adding ? cup of popcorn kernels and 1-3 tablespoons of oil to the popper. Then place the popcorn popper on the stove, gas or electric, set medium to medium-high heat. Turn the crank as the popcorn pops until the popping slows down, then remove from the heat and dump into a bowl through one of the two doors. The Whirley Pop can make around 6 quarts of popcorn in about 3 minutes. The instructions suggest just wiping out the pot rather than washing it after every use. This way the pan becomes "seasoned" which means you can use less oil if you prefer. The Whirley Pop has a huge number of users that loudly sing its praises. Nearly everyone agrees that it makes great stovetop popcorn. However, a small minority, about 10%, of users were very dissatisfied with the quality of the unit. It appears that over time the quality of the Whirley Pop has decreased similar to many other consumer products that are constantly being redesigned to reduce product costs and remain competitive. The majority of the complaints focus on the flimsy construction of the popper. The pot and lid have been described as "paper thin" or "like aluminum foil" by disgruntled users. The gears on the stirring mechanism of the Whirley Pop are plastic making them unreliable. The Whirley Pop stovetop popcorn popper does have a 25 year warranty. They are good about replacing failing items but there are shipping and handling charges so replacement parts are not totally free. More often than not the saying, "You get what you pay for." holds true. So if you're inclined to pay a little more for a stovetop popper you may want to consider one of the other two poppers mentioned in the Stovetop Popcorn Popper: Recommendations section for stovetop popcorn poppers that are more well built than the Whirley Pop.